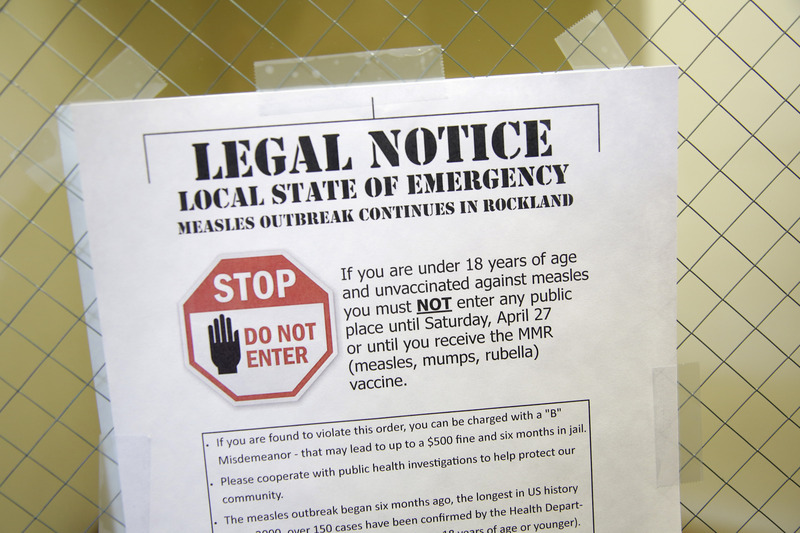 Monsey, NY - Upping the ante in the war against measles, Rockland County Executive Ed Day issued two new directives today aimed at curbing the seven month long outbreak, warning that violators could face fines of up to $2,000 per day. Day made his announcement at a Tuesday morning press conference with Rockland County Commissioner of Health Dr. Patricia Schnabel Ruppert. As previously reported on VIN News (http://bit.ly/2UkGs9U), Day issued a 30 day, countywide state of emergency at the end of March that banned unvaccinated minors from indoor public areas, but that order was overturned by a Supreme Court judge nearly two weeks ago. Under the new Communicable Disease and Exposure Expulsion Order, any person with a confirmed case of measles or who is linked to an ongoing DOH measles investigation would be barred for up to 21 days from all indoor or outdoor places where 10 or more people gather. The directive also requires those who are currently subject to an exclusion period or their parents to prohibit all non-immunized guests, relatives, visitors or workers from entering their homes unless they are providing pastoral, home care or medical services. Violators and those who refuse to provide details of their illness to the DOH, including where they have been and who they have been in contact with, can face stiff financial consequences. Parents will be held accountable if their measles-exposed children fails to comply with the order, warned Day. While the vast majority of Rockland County’s yeshivas have already closed for Pesach, a second order would allow mandatory vaccinations in school for all students that have yet to produce vaccination records or medical proof of immunity, although medical and religious exemptions are permitted. Failure to comply would also be trigger hefty daily fines. Noting that measles killed 110,000 in 2017, Day said that he refused to do nothing while measles continues to spread in the county. As of yesterday, 186 confirmed cases have been reported in Rockland, an increase of more than two dozen since Day declared the state of emergency on March 26th. What a tremendous lie that 110,000 people died of measles, Here in the USA only 3 people died of measles the last 15 years. Before anyone starts screaming that its almost like a blood libel think twice. Most anti vaxxers in the Frum community know nothing. They just burp out what they are told to monkey see monkey do. Measles has killed two people in the US in the past generation. Mr. Day should look up the study of Measles Mary, the fully vaccinated woman who, in 2011 contracted the measles and passed it on to other fully vaccinated people. Dr. Jennifer Rosen, led the investigation as director of epidemiology and surveillance at the New York City Bureau of Immunization. There have been numerous outbreaks among highly vaccinated populations around the world. US gov't is suing Merck for fraud regarding claims for the effectiveness of the MMR vaccine. This seems more targeted towards infectious individuals than anti vexxers. Logically, this will stop spreading as has been done for hundreds of years. You liar, not counting encephalitis and pneumonia that results from measles infection, or anyone previously immunocompromised! “ Measles has killed two people in the US in the past generation. All your information is actually a lie, there are NO lawsuits against Merck. Dr. Jennifer Rosen, led the investigation as director of epidemiology and surveillance at the New York City Bureau of Immunization. Has repeatedly declared this to be misinformation and a smear against her. Measles has only killed two people in the US in the past generation because until recently most people were vaccinated against it. True; all that stat would prove is that the vaccine works! Keep this nonsense up, and people are going to start asking whether unvaccinated Jews should be confined to a walled-off area. Like a ghetto. Please stop repeating talking points without understanding what you are actually talking about. 1) "Measles Mary" Yes, she was vaccinated but her body didn't mount the usual immune response. That's why we talk about the vaccine being 99% effective. Nobody claims that vaccination is 100% effective! 2) "Measles Mary" passed it on to 4 other people, 2 of whom had been vaccinated. Immunity sometimes "wanes" (decreases) over time. This is especially true for older Americans who received an earlier formulation of the measles vaccine. 3) From Dr. Rosen's article" "This is the first report of measles transmission from a twice-vaccinated individual with documented secondary vaccine failure." It is the "FIRST REPORT:" out of the millions of vaccinations over decades, this is the first documented case of a double failure of the vaccine. It certainly does not mean that vaccine failure is widespread, that vaccines don't work, etc. 4) Your assertion of "numerous outbreaks among highly vaccinated populations around the world" needs support.